With the FA Cup semi-final, pubs attract their fair share of crowds. Today I spotted a Spurs supporter with deposits of cholesterol around his eyes, along with a physique one can only get from eating all the pies. This spot diagnosis took me back decades to my days as a medical student at the Middlesex Hospital, when we’d try to convince ourselves that time spent in a local hostelry was equivalent to the same amount of time spent poring over textbooks. I say ‘we’ but the pub pathology sessions were a guy thing. There were just four women in my year. Swots that we were, however, we often tagged along to make sure we didn’t miss out on anything educational. We didn’t just think of the pub as a causal factor in disease, though it must have been in some cases. One of doctors would regularly claim that the King & Queen had given him spider naevi (small blood vessel swellings typical of liver disease). In the interests of presenting both sides of the story, I’d like to add that Steve from my year was convinced that impurities in the beer were to blame for all the complications of excess alcohol. “Also known as rodent ulcer,” another student might offer. “Unlike squamous cell carcinoma,” added a show-off. A pint or two later, one of us claimed to have spotted psoriasis. All nodded sagely, even though at that stage we barely knew the difference between psoriasis, cirrhosis, and sclerosis. It was like winning the jackpot when a man with a stomping gait entered the pub one winter evening. This type of gait occurs in late syphilis, when foot position sense is lost, so the person bangs the foot down hard at each step. Although it’s possible that the man was just been getting the snow off his boots. I like to think that the fictional GP Geoff from my novels will have once given pub pathology a whirl. On the whole, however, education has moved on. Sitting in the pub is not a learning method I’d recommend to my current medical students. For one thing, misdiagnosis is common. For another, it’s rude to stare. Though sometimes it’s impossible not to. In one saloon bar, there was a man with a massive swelling down there. So ginormous did it grow that he needed a wheeled trolley to help him (and it) get around. He finally did seek expert advice, but, it was said, only when one of the wheels fell off the trolley and needed to be replaced. One keen student was desperate for the chance to shout, “Let me through – I’m a medical student,” but we never witnessed a medical emergency. Lucky, really, as our life support skills at the time would have done nobody any favours. We never saw anything as dramatic as the stripper and the snake, though we all heard about it, naturally. This particular lady had a snake as part of her act, until the night her sidekick decided to hug her neck a tad too tightly. She was rushed to A & E wearing little more than a sizeable reptile, where an anaesthetist injected the snake with muscle relaxant and saved her life. As I say, we all heard about it. But we missed it. We were in the pub instead. 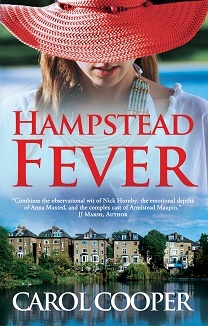 GP Geoff and other characters can be found in my novel Hampstead Fever. I recognise all 3 books, but no longer have them! I do have similar memories of spot diagnoses in the pub!